This amazing toaster oven has a unique design with traditional crafts of Cuisinart. Cuisinart has put two up to the mark technologies in this cooking expert and makes it the apple of the eye of every housewife. First is the Exact Heat Sensor technology and along with it is the very famous Always Even technology for toasting. This oven also has a large capacity, powerful cooking capabilities and a very charming brushed finish look which makes it really classy sitting on your countertop. It also comes with a 3 years warranty. The exact heat technology is based on the heat sensors that help maintain, regulate the temperature of the compartment with utmost precision and hence the foods receive exact amount of heat needed and are free of usual problems like being undercooked or over cooked. Are you tired of getting either plain white or burnt toasts every morning and have been longing for getting a glimpse of perfectly toasted bread? Well Cuisinart presents this oven with another extraordinary feature of toasting, by which the slices are perfectly toasted with an even shade distribution according to your selected shade. So with this technology, there will be no more white or over burnt slices. Along with many outstanding features, this oven has 2 hours timer which is rare, with a real time clock displayed on its large blue back lit LCD panel. This toaster oven broiler has an auto shut-off function to help save energy in case you forget to turn it off. There are a number of other amazing features such as digital touch controls, metal brushed finish with stainless steel construction. It has 8 cooking options that help you handle most recipes. They are Toast, Bagel, Bake, Broil, Keep Warm, Reheat, Convection and Defrost. So what are the Pros and Cons of Cuisinart TOB-135? 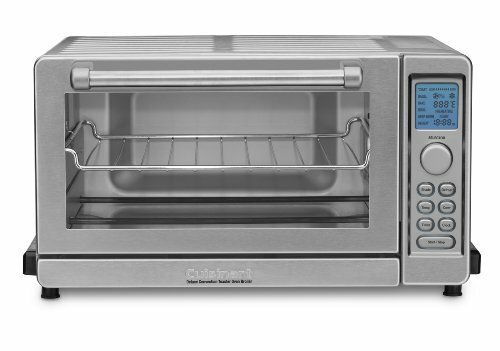 Convection Technology – This toaster oven broiler has a great convection performance as offered by the old models. Customers have sent feedbacks with the amazing performance of the convection function and the fan is quite pleasant in this model since there is no traditional convection fans noise in this model. Easy Control – The control panel is amazing! In every cooking mode, the relevant buttons are lit with an LED in the background. This helps you easily know which mode is working now from a distance. A simple detail that loved by customers. Even Cooking – With two amazing technologies, Exact Heat and Always Even, Cuisinart has won the market by providing even temperature distribution for not only cooking but also for toasting of bread. Display LCD – Although the buttons with LED background make it easy to know cooking mode from a distance, one reported problem with this toaster oven broiler was with its blue backlit display LCD. A few users say that they find it hard to read on this LCD display unless they come closer or maintain a perfect eye level with the display. Selection Knob – Another reported issue is with the selection knob. Some users find it really hard to get to the required option since they find it easily skips the option to be selected. They think the control knob is very fast and hard to control. Well I think Cuisinart must definitely look into it. Door Handle – The door handle is pretty close to the glass and hence requires to be handled with extreme care in case burns while the oven is being used. This Cuisinart’s product is lovable and great to use, despite the few draw backs mentioned earlier, this appliance is a good thing to have within this budget range and owners are enjoying using this. For more details and recipes of this product you can also refer to its manual.